Many of the Motorcycle accidents that we handle are those that happen when a rider tries to negotiate winding country roads in Southern California. I’ll bet you can’t count the number of times a driver has tried to maneuver around you on a tight corner. You’re supposed to have the full use of the lane, even though your motorcycle takes up barely half of that width—but some drivers seem determined to get as close to you as they can. After barely avoiding a trip down to the bottom of a gulch, you’re tempted to blame the driver—but what if the road itself could have played a part in the crash as well? In both instances, taking extra care when navigating these types of rural bends can make all the difference in avoiding an accident. 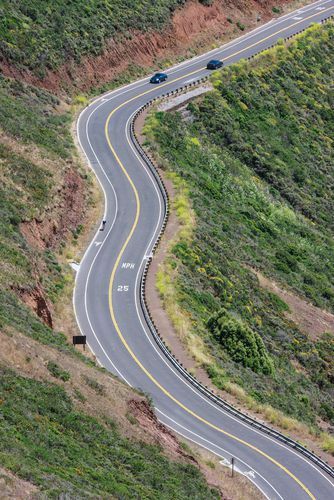 Even if you think that the bend is a short one and the road immediately opens up after the curve, there could still be a car approaching unbeknownst to you. Slowing down, staying in your lane, and take the curve at a lower speed will give you enough time to see whether or not a car is present, thus avoiding a collision with it. One way to determine how the road changes after the bend is to look at the way the trees, streetlights, or telephone poles are lined up. Also, watch out for signs warning of a curvy road ahead. Keep your headlights on, even during the day, to give other drivers a warning that you are trying to make the curve. Also, never try to pass another vehicle while approaching a bend in the road. Stay in your lane at all times. While aggressive drivers can be to blame for a crash, the truth is that many roads are just not designed for the optimal safety of motorcyclists. A driver may have forced you off of the road, but a missing guardrail could be the difference between a broken leg and certain death—something the engineers who designed the road should have taken into account. Blind curves. Motorcyclists need to lean their whole bodies to make a turn. This maneuver can be deadly on a blind curve, especially if a distracted driver is in the opposing lane. No shoulders. Bikers need adequate shoulder room to swerve around obstacles in the road or to avoid a rear-end accident, but many of these have been narrowed in construction or forgotten altogether. Lack of lights. Motorcyclists do not have the same level of lighting that cars do when traveling at night, and need regular lampposts to see the condition of the road and potential obstacles. Narrowed lanes. Lanes that have been narrowed in construction present particular problems for bikers, such as a biker’s front wheel becoming stuck in the grooves between pavement grades. Improper signage. Part of making the roadways safe is posting warning signs for sudden curves, lane merges, and changing speed limits far enough ahead to give all drivers time to react. If you were injured after a bike accident on Southern California roadways, we can help you find out who is to blame. Click the contact link on this page to tell us your story, or order our free guide, 7 Big Mistakes to Avoid After a Motorcycle or Bicycle Accident, to get more vital information in your case.